GREENSBORO — Tyler Hodges just nicked the grass with the swing of the golf club, and then — with PGA tour player Will McGirt encouraging him — knocked the tiny white ball off its tee and across the grass. “There you go!” McGirt said over the applause of the galley of onlookers before giving the 11-year-old with a wide grin a high-five. Some of the best outings on the greens during the Wyndham Championship are taking place just beyond a tent with a “2018 All-Star Kids Clinic” sign blowing in the wind. Tyler, who has Down syndrome, is among 25 special needs children and young people ages 8 to 18 called “All-Stars” taking part in the clinic, which puts them on the links with tour players and caddies. The Tesori Family Foundation clinics, which take place each year at the Grandover Resort in the days before the tourney officially starts at the Sedgefield Country Club, involve children in groups whooping and hollering and laughing their way through different stations where they hit clubs on the driving range and get lessons on putting and chipping from some of the athletes they might see on TV. But take in a few seconds of this day and it’s about more than young people hitting around a few balls. Parents see their children clad in “All-Star” shirts taking part in activities like other children. Some of the children rounding the courses would not get to regularly play outside without all the support around them. Some walk in braces or with walkers and the parents of others are holding onto medicine nearby. “We don’t want them to feel like they are anything but All-Stars today and we want them to be spoiled,” said Paul Tesori, who caddies for PGA pro and Wake Forest alumnus Webb Simpson, who won the 2012 U.S. Open and the 2018 Players Championship. Tesori looked out at the rambunctious group. Tesori and his wife Michelle, whose son Isaiah has Down syndrome, have hosted the clinic since it started five years ago. Isaiah had a seizure shortly after he was delivered and doctors weren’t sure if he’d survive. They weren’t sure of the cause either. Whisked by ambulance to a children’s hospital, he would stay in the neonatal intensive care for months. The Tesoris had already started a foundation that sowed into the lives of others, including donating laptop computers to homeless children headed to college. Thankful for their son’s survival, they were led by their faith to help other families. Soon, among the many other projects, they would add a clinic that matches their love of the game with that desire to give back. And it started on the practice greens at Grandover. Wyndham’s tournament director Mark Brazil and foundation director Kelly Guthrie were separately talking to the Tesoris after Isaiah was born and they kind of hatched the idea. Michelle Tesori had also just started a blog that chronicled their journey and was soon popular with other parents with special needs children. Isaiah, now a thriving 4-year-old, is missing this year’s tournament because of a hand injury and is back in Florida with his mom. “We didn’t know what it would look like but we knew we wanted to do something,” Paul Tesori said. This year, the nonprofit crosses the $1 million mark with in-kind contributions and cash donations, which go directly back into the program. The clinic has expanded to two other major tournaments and other groups have called about starting others where there are none. “We hope they are everywhere,” Tesori said. Locally, partners include the nonprofit First Tee of the Triad, which teaches golf to young people while instilling life lessons and honing their leadership skills. Tesori said they do all the preparation work. First Tee draws college students, teachers and professionals who have dedicated their lives to working with exceptional children, its own young golfers and Wyndham volunteers to work behind the scenes and participate as one-on-one coaches and people on call to do everything from setting up snacks to making them feel welcome. This year the organization had so many volunteers respond that the foundation plans to open the clinic to more children for the 2019 tournament. Parents can sign children up for the clinics on the foundation’s website. 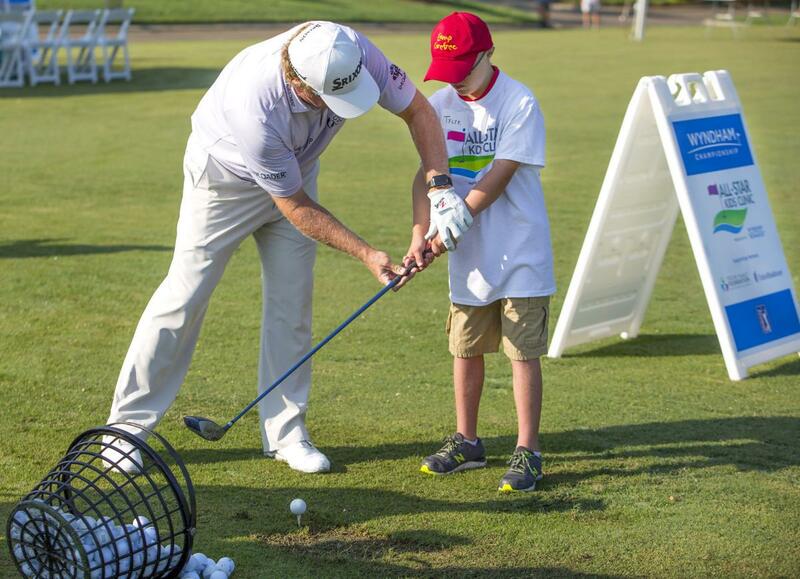 So, there was Wesley Noble, in his leg braces from cerebral palsy, at a putting station swinging at the ball. “He’s a natural — sign him up!” Tesori yelled Wesley’s way after a particularly nice stroke. Nearby, Terrance “TJ” Gerald straddled over the ball at Station 8, as 13-year-old volunteer Paul Howard encouraged him on. “You can do it!” Paul said as TJ, who has autism, took a swing. A single tap, a few seconds of watching wide-eyed as the ball sailed down the sliver of fairway and a hole-in-one, which made everyone around him stop and cheer for the 11-year-old. Fentress Gerald, his mother, was brought to tears after TJ then ran off to the next station with a pack of newly made friends. “They put labels on him, like he wouldn’t do certain things or look you in the eye or say ‘I love you,’ “ she said of past diagnoses. “We’ve found that exposing him to new things is the best way to blend him into society. Paul, the young volunteer, now gathering the balls the players left behind, said he felt a special calling to participate in the clinic. Chad Reynolds, the caddy for Keegan Bradley, who won the 2011 PGA Championship, was helping a group of children with their form. He waited patiently as one struggled to hit the ball — and was the first to raise his fist when the boy made contact. “These kids maybe can’t hit the ball like other children but when they do they inspire everybody, even those of us who put in a lot of practice,” Reynolds said. The day ended with the children being called individually to the front of the group so an achievement medal could be placed around their neck. And following tradition, it meant first doing a dance — which the newer children gleefully joined in when it was their turn. A few just flashed toothy smiles. For Camden Creed, who is autistic, it was a few seconds of break-dancing, to the crowd’s delight. “Do you know how long I’m going to have to hear about this?” his grandfather Jim Creed playfully groaned from the crowd. As he walked to his grandfather’s truck, Camden could also be heard over all the others. “This has to be one of the best days ever!” he said, proudly handling the medal still around his neck.